Will You Help? Will You Act? This advertisement appeared in the National Review, the The New Republic, NewsMax, the Weekly Standard, The Nation, Reason Magazine, the the American Prospect, and The Progressive in winter of 2003. Will You Help Ashley and Her Dad? Federal prosecutors won't permit court testimony concerning why marijuana was used, even though marijuana is permitted as medicine under the laws of California and eight other states. And because juries have no way of knowing otherwise, Federal prosecutors accuse patients and good Samaritans of being "Drug King Pins." How can judges and jurors dispense “justice and mercy” without relevant information? According to a TIME / CNN poll, 80% of Americans approve of medical marijuana. Please urge Attorney General Ashcroft to permit the presentation of all of the evidence. And ask your congressman and senators to pass a law preventing future concealment. * Bryan Epis was sentenced to ten years. The story the jury did not hear: In 1983, while in high school, Bryan was a passenger in a car that hit a telephone pole. The car decelerated from 35 mph to 0 in 20 milliseconds. Bryan had lacerations all over his body, 15 inches of lacerations in his skull, his sternum was fractured and two ribs were broken. The T2 and T3 vertebrae suffered compression fractures. The surgery just to stitch his head together lasted 2½ hours. He was in a coma for two days, and intensive care for three days. The surgeon said he was lucky not to be a vegetable or dead. Bryan began two years of physical therapy. He was told that the compression fractures would never heal, and they haven't. He suffers from chronic pain. He was prescribed heavy narcotic and narcotic derivative drugs, codeine and Vicodin for the pain. In 1983, his orthopedic surgeon recommended marijuana as a drug that could relieve pain better than the narcotics. Bryan used cannabis from 1983 to 1997. Using marijuana in combination with exercise, he reduced the pain level from level 10 to level 1. 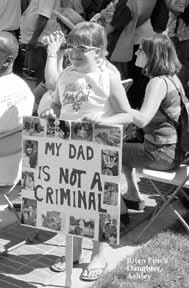 While using cannabis in his treatment, he finished high school; finished the grueling program for a Bachelor of Science degree in Electrical Engineering from California State University at Chico in May 1991 (only 1 in 5 who enter the program graduate); and finished law school at California Northern School of Law in May 1998. Bryan’s explanation for growing the marijuana was that he needed it to alleviate his pain and to help other seriously ill patients.